This is no joke! It has been confirmed that this trade is official. Quite the movement of talent to say the least, not to mention the money! But why did this trade happen? The Texas Rangers made it very clear that they wanted to move a middle infielder, whether it be Kinsler, Elvis Andrus, or Jurickson Profar. It was clear that Kinsler would be the best of the three for them to move, as the other two are still in their young 20s. Also, Kinsler’s contract doesn’t last as long as the others, so they don’t lose a ton of control of a valuable player. With this trade, Profar can now become the everyday second baseman. But there’s more to that than you may think. The Texas Rangers wanted Profar in the lineup every day, as opposed to the utility role he served in 2013. Thus, a trade needed to be made. But was Kinsler unhappy about this? Perhaps. There were many rumors that Kinsler would have to change positions to either leftfield or first base. Kinsler is a two-time 30/30 player (HRs and stolen bases), so considering his speed, moving him to first base would waste that speed. This potential move makes sense, considering David Murphy just left as a free agent to play with the Cleveland Indians, and Mitch Moreland hasn’t played up to his full potential. There are plenty of outfielders on both the free agent and trade markets, but not first basemen. So they made it happen by acquiring Prince Fielder. Now, why would the Tigers do this? The Detroit Tigers were expected by many to repeat as AL Champions in 2013 and maybe even win the World Series. They received these expectations after signing Prince Fielder to a 9-year/$214M contract in the 2011-12 offseason, and his first year was a huge success. He won a Silver Slugger and took his team to the World Series. This was seen as a very hefty contract, but the Tigers had the money to spend and felt that they needed that left-handed bat in the middle of their lineup. Though he had a down year in 2013 (at least for his standards), he has done everything the Tigers have asked him to do. The Detroit Tigers also have a large hole at second base. Omar Infante, their regular second baseman in 2013, is now a free agent. Not knowing if he would resign, Tigers GM Dave Dombrowski didn’t hesitate in finding his replacement. Ian Kinsler, in my opinion, is the third-best second baseman in the game (only behind Robinson Cano and Dustin Pedroia), and with the inflation currently in the game of baseball, Kinsler’s contract doesn’t comparatively look too much look like an overpay. Trading for him seems to be worthwhile, but at what cost? Prince Fielder! Who wins the money-side of the trade? Considering that there isn’t a drastic difference in their talent, I would rather take a guy who’s making over $100M less. This is a big win for the Tigers. Who had a bigger net upgrade between first and second bases? I believe that each player is a top five player at his respective position. Because first base is a significantly stronger position than second base right now, finding a good second baseman is hard. It’s not as difficult to find a talented first baseman. Now, I still believe in Mitch Moreland. I don’t think that the Rangers HAD to trade for Fielder as much as they had to move Kinsler. So it doesn’t make too much sense, from this perspective, for the Rangers. But it made MUCH less sense for the Tigers. Because now we must ask the biggest question of all: who takes over as the Tigers’ first baseman in 2014? Um… exactly! Who will fill the role of cleanup hitter now? Ultimately, Victor Martinez will get the first stab at it, but his hitting prowess doesn’t compare to that of Prince Fielder. It is no contest here: advantage, Rangers. Who had a bigger hole to fill? There are more available second basemen than first basemen on the free agent market, so finding one wouldn’t be terribly difficult. The Tigers could’ve found any second baseman and given him a smaller contact, and he could’ve been serviceable. Brian Roberts and Mark Ellis fit this profile perfectly. Like I just said, the Tigers’ first base is a massive, and I mean MASSIVE, hole to try to fill. So the Tigers didn’t fill a hole, they created one. On the other side, the Rangers had a surplus of middle infielders and felt a need for an upgrade at first base (like I said, I don’t completely agree, but I understand where this is coming from). So, there wasn’t a huge problem to fill, by default, the Rangers win this argument. And, of course, who’s the better player? You could look at this from a bunch of different angles. To make it simple, we’ll look at three: at the plate, on the bases, and in the field. Fielder clearly has the advantage at the plate, but not as much as you may have first expected. 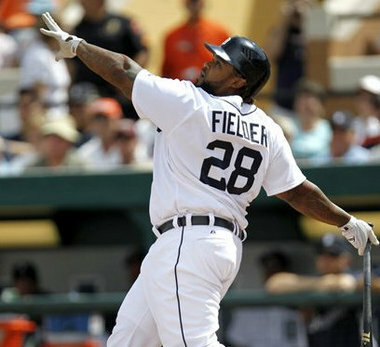 There are many comps to Fielder as a first baseman at the plate (i.e. Votto, Goldschmidt, Davis, Gonzalez, and Freeman) and not as many to Kinsler (considering power and contact, only Robinson Cano and Brandon Phillips). I’ll still give Fielder the benefit of the doubt. On the bases and in the field? Kinsler is the clear-cut winner. When you put this all together, what’s the answer? They really are so close, it’s hard to make the call. I could easily be persuaded either way. So one edge for the Tigers, two for the Rangers, and a tie. Does this mean that the Rangers automatically win the trade? Not quite. The money argument is the most lopsided, in my opinion. They are similar players, after all, yet Fielder is being paid more than double what Kinsler is making. So considering all of this, who wins the trade? I really don’t know. It is still too close to call and too early to judge. If I had to make a guess, I think this gives the Rangers a bigger immediate boost, but the Tigers will be more satisfied in the long haul. Again, I don’t feel strongly about this on either side; it’s just my prediction. What I can tell you is that a trade of this magnitude (one star for another, straight up) is very rare. Normally, it’s easier to judge the winner, but not here. The Detroit Tigers and Texas Rangers have made significant trades to their roster, so these two teams will be very interesting to watch going forward. Cabrera moves back to 1B where he should have been all along. And all the good first basemen are locked up and not going anywhere; it’s much easier to find a second baseman, mostly because you don’t expect him to carry your offense like a first baseman does.